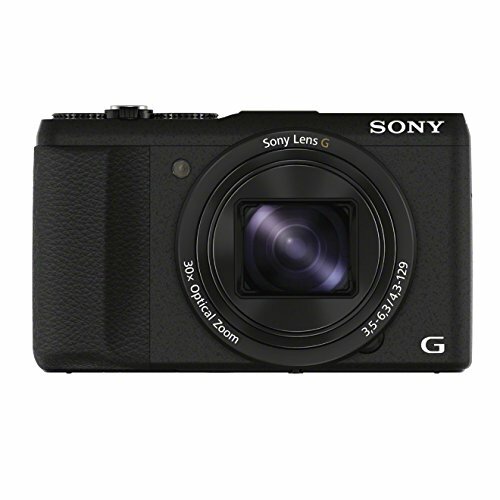 There is no shortage of 30x optical zoom compact cameras on the market in 2014, with the Sony Cyber-shot HX60V slotting neatly into the company's compact lineup. If you're looking for a zoom to cater for wide-angle group shots and those far-and-away subjects then this could be the compact camera for you. But with few advances compared to last year's HX50V model, and in a market now occupied by more robust feature sets from the likes of the Canon PowerShot SX700 HS and Panasonic Lumix TZ60, can Sony stay ahead? The HX60V has exactly the same body design as its predecessor. That means its just shy of 3.9cm deep which is a fair achievement considering the 24-720mm equivalent focal length of that zoom lens. However, both Panasonic and Canon equivalent competitors are under 3.5cm thick, taking advantage of newer designs. Even so, the Sony is a pocketable camera that delivers plenty of pop in the zoom department. The lens offers a 24mm wide-angle equivalent for capturing group, landscape and similar such shots, while it can also extend smoothly through its zoom range to a maximum 720mm at the top end. At this full extension it's possible to shoot distant subjects so they dominate the frame - we've been shooting seagulls in Brighton with few problems at all. When that lens extends the HX60V's optical image stabilisation - which Sony brands Optical SteadyShot - kicks in to help stabilise the preview frame, otherwise it'd be tricky to keep the subject locked into the frame. This works by moving the lens elements by microscopic amounts to counteract handshake in real time and it works really, really well. We wouldn't have been getting such good seagull shots without it, that's for sure. If you're a more advanced photographer then don't expect the world from the HX60V though, as its f/3.5-6.3 maximum aperture settings are fairly average. Again, though, it's of a very similar ilk to its two nearest competitors from Canon and Panasonic. If your mind boggles at the presence of such numbers then don't worry - the HX60V has all the automated point-and-shoot modes that you could ever need where the camera will take control. All you need to know is that the aperture controls the amount of light that enters the camera. Typically as a zoom lens extends the amount of light that can enter drops, which limits the level of control over settings and, in lower light, that can be a problem for focus, blur and resulting image quality. But Sony's desires are for the HX60V to appeal to a wide set of potential users. Despite being a point-and-shoot style model, the presence of a physical mode dial and exposure compensation dial show off its more advanced aspirations. These are great for quick adjustments, particularly the exposure compensation dial. There's also a hotshoe for adding additional accessories such as a flash or electronic viewfinder. The latter is an unlikely link, however, as the Sony EV1MK OLED finder accessory costs more than the HX60V does in the first place. Saying that we can see the appeal of adding a viewfinder, particularly as we found the rear 3-inch LCD screen to suffer in sunlight. It's nothing unusual, but in the direct sun at the seaside it was tricky to judge the composition and exposure, leading us to push the LCD brightness settings to their maximum +2 in the menu settings. At least such an adjustment is available. A viewfinder would have been a useful alternative here, but we could only imagine an existing Sony user who already happens to own one finding the benefit in conjunction with this particular camera. Another minor criticism is that the HX60V, like its predecessor, doesn't offer a lens-based control ring. Perhaps that's too high spec to anticipate at this level, but it's something the Panasonic Lumix TZ60 offers (along with a built-in viewfinder) without demanding too much more cash for the pleasure. The Sony teeters on the high end of low, really, offering some advanced settings but not quite succeeding in pulling it off throughout its feature set. We found the Cyber-shot HX60V to perform well in a variety of situations, zipping subjects into focus with ease for the most part. We were predominantly shooting in good light which is when the camera works best; shoot in auto modes and the camera will typically select from its centre-based nine areas with a green AF area and associated "beep" (unless volume is switched off) confirming focus. Shift over to the manual modes and there are more focus types at your disposal. Wide auto is the same as found in the automated modes, whereas Center and Manual options provide a defined focus area. We typically used Manual as this point can be positioned around the majority of the screen, bar the outermost edges. Press the centre button of the d-pad and the camera dives into AF Tracking for moving subject focus, but results are a bit mixed in this mode. Manual focus is also possible where the rear d-pad is used to adjust the focus distance. However, the lack of a focus-distance measure instead sees a display bar that merely shows a cursor between a "head-and-shoulders" and "mountain" icon - just like in the HX50V it isn't as detailed as it ought to be. Overall the Sony HX60V performs much like its HX50V predecessor. There is a new processor to speed things up, but it's not so significant that current HX50V users would hang up their old devices - it's a subtle change. This similarity does mean the same decent battery life and accessible Wi-Fi modes also feature. In addition to the GPS-capable HX60V model, as reviewed here, there's also a straightforward HX60 model that will cost around a tenner less. The choice is yours. Despite featuring the same 20.4-megapixel sensor as its HX50V predecessor, the HX60V boasts a new processor and that means it has more grunt to handle imaging data. Even so its images are of a similar ilk to before which means that, while good enough, they're not best-in-class - all the more apparent when viewed at 100 per cent scale. Both the Canon SX700 HS and Panasonic TZ60 trump the Sony in this department. You'll only really notice when viewing the Sony's images at full size scale, though, and as an upwards of 20-megapixel resolution makes for huge images - bigger than you'll need them we would think - typically some of the less refined details will be "hidden" away when not used at full scale. If you're all about viewing on screen, sharing on social media or printing A4 then you'll see no big issues. From the lowest ISO 80 sensitivity shots have enough detail in them, but the high resolution means processing renders pixilated areas and smooth gradation lacks. As the ISO increases - typically to compensate lower light conditions - so processing has to work harder and results dip in overall detail and colour vibrancy. But not to excess, it's par for the course at this level - but it's the unwarranted resolution that sees the Sony outclassed in the category. Just like the HX50V, the HX60V does a good job of squeezing out much of the colour image noise, and as there's no raw file capture you'll always need to rely on the camera's output. There are menu-based settings to control sharpness, colour saturation and noise reduction which is useful - but as they can only be set prior to shooting they have their limitations. We found some colours looked over-saturated in our default settings too, particularly greens. Overall the HX60V needed to compare to its nearest rivals to be seen as the camera of choice. In the shadow of both the Panasonic and Canon offerings it shows that the Sony needed to reinvent itself to excel. Saying that, results aren't bad by any means and will more than do the job that they're designed for. As a standalone camera there's enough to like about the Sony Cyber-shot HX60V and if you buy one we're sure you'll be content with what it can do. Its significant zoom lens, physical control dials, decent optical image stabilisation and a battery that performs well are all plus points. But the HX60V is such a marginal update over the earlier HX50V model that it almost cancels itself out. Same body, same lens, same sensor - it fails to stand out. And with the market progressing - both the Panasonic Lumix TZ60 and Canon PowerShot SX700 HS are considerable competitors - Sony's grip on its 30x zoom monopoly has slipped. Our score may seem harsh, but of those three cameras the Sony sees itself outpriced and outperformed just enough to cost it that half star. Another problem is the earlier HX50V model is available for £250 on Sony's official store and this earlier model seemingly undermines the latest one. With both Panasonic and Canon answering Sony's dominance in this category it's cost Sony to not push out a more significant update this time around. All eyes to the HX70V then.